IN the next 10 years, medical technology firm Becton, Dickinson and Company (BD), which uses Singapore as a base for the region, will manufacture more than half of its products in Asia. 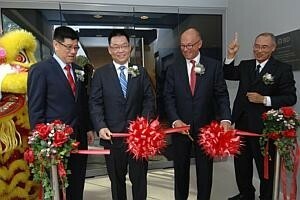 This vision was shared on Monday, at the launch of its expanded operations, as it marked its 25th year in Singapore. Bill Kozy, BD's executive vice-president and chief operating officer said that the company aims to be "a real device leader" in the region, and while it now manufactures more than half of its products outside Asia, this would change over the next decade as BD gets comfortable with its longer-term strategies. The expansion comes on the back of greater government expenditure on healthcare needs, said James Lim, BD's president for Greater Asia, who noted that in China alone, about 6 or 7 per cent of its gross domestic product is spent on healthcare and this has risen yearly. Mr Lim added that the company will also focus on the next step - global talent development. BD had started as a manufacturing facility in Tuas in 1989 with sales of less than S$100 million and fewer than 50 staff. Business in the region is now worth US$1.5 billion and they have almost 1,200 employees. In 1999, BD established Singapore as its research hub for Asia, focused on creating solutions to meet the healthcare needs in the region. Faced with Singapore's rapidly ageing population, the Economic Development Board (EDB) has provided opportunities for companies to co-develop and test-bed solutions with the country's healthcare clusters. Yeoh Keat Chuan, EDB's managing director, noted that the testing of these creations for Singapore and Asia creates value which results in "the downstream manufacturing of high-value medical techological products". "We want to ensure that as our population ages, we have solutions that meet our needs and the concept here is Singapore as a living laboratory to test out some of these solutions which they can then export." An example of this is the Odon Device - a new obstetrical instrument used in the delivery of newborns. The device is to be tested and manufactured in BD's Singapore plant and is expected to be available in three to five years' time. Singapore's medical technology industry has more than tripled its manufacturing output from S$1.5 billion to S$5 billion since 2000. Over the same period, the manpower base more than doubled from 4,000 to 10,000 people.